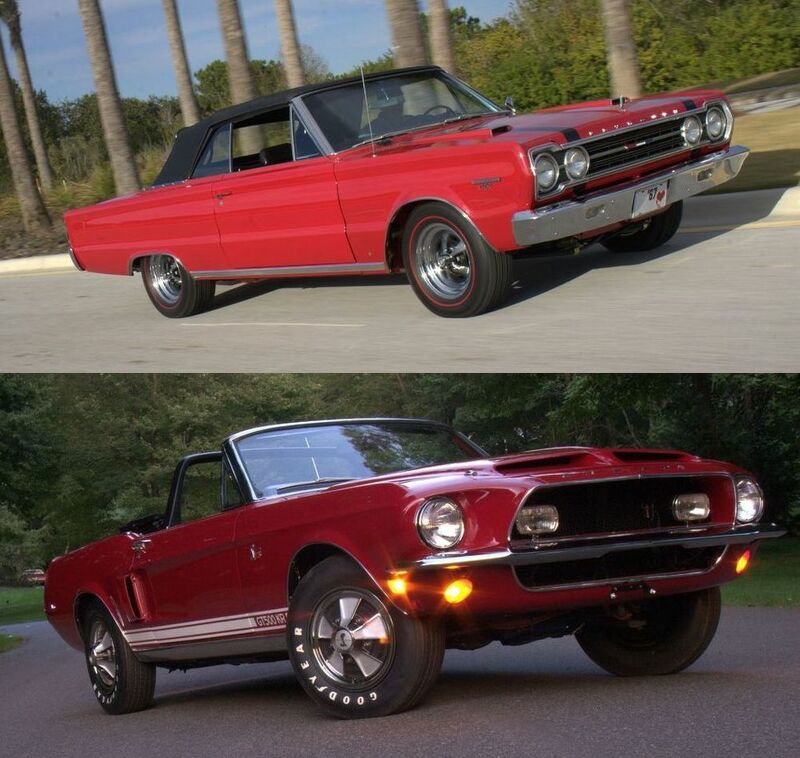 1967 Plymouth Belvedere GTX (top); 1968 Shelby G.T. 500 KR (bottom). Images by the author. Editor’s note: This or That is not a comparison report between two vehicles, but rather a feature that enables us, in an idyllic world, to add a collectible vehicle into our dream garage on a regular basis, but with a catch: We can only pick one vehicle from this pairing, and it has to be for enjoyment purposes rather than as an investment. It’s time to launch our first edition of This or That – Summer Series, beginning with a pair of go-fast convertibles: a 1967 Plymouth Belvedere GTX and a 1968 Shelby G.T. 500 KR. We know what you’re thinking already: How can a GTX compete with a Shelby? One is an intermediate; one is a pony. Our featured duo may be closer than you think despite the wheelbase and weight difference. The GTX has a high-strung 440; the Shelby has the underrated mid-year 428CJ. On the track, contemporary test reports recorded nearly identical 0-60 MPH times. And both made a visual statement while sitting in a static state at the local snack bar during date night. But let’s not forget that this is not a heads-up competition or a comparison. So before making a rash decision, here are a few details about each car (if you want to read more than we’ve provided, both vehicles were former subject material in our Hemmings Muscle Machines magazine–just click on the links above). Chrysler Corporation’s strong performance arm stretched all the way back to 1955 when the parent division pulled the wraps off their C-300 (and subsequent 300B) that, in race trim, smashed records in both NASCAR and AAA stock car circuits for two straight years. The effort quickly flowed into the Dodge and Plymouth divisions, where it continued with increasing success. By 1966, when the contemporary “supercar” movement was ramping up to full song, Plymouth was a key player with their Belvedere family of cars. The unit-body intermediate line, which included the top-of-the-line Satellite, was offered with a buyer’s choice of a 318-, 361- or 383-cu.in. V-8, as well as the race-inspired 426 “Street Hemi. Bolstered by a visual redesign, combined sales soared just past 189,000 units, but there was one problem. Plymouth’s power-laden Belvederes were sleepers. Lack of visual performance recognition suited the street and strip competition scenes just fine, but for the youth of the era who wanted to stand out in the crowd, the tiny “383 Four-Barrel” badges and “426” hood ornament inset did little. Product planners must have been paying attention, because when the 1967 models were announced the all-new Belvedere GTX had been added to the family tree. The GTX carried a starting price of $3,418, which provided buyers plenty of punch. Visual identifiers were dual fiberglass faux hood scoops; small, yet prominent “GTX” badges at the tip of each fender and on the trunklid; a racing-style, flip-open chrome gas cap; a GTX-exclusive blacked-out grille, with a special red, white and blue badge in its center; and a new rear fascia. Additionally, the cast hood ornament included a 440 or 426 stamp on each side. Fresh, aggressive body lines replaced thin chrome trim on the flanks, and the whole package could have been topped off with optional dual stripes that ran the length of the hood and trunklid. This wasn’t the same 365hp 440 offered in Plymouth’s 1966 full-size lineup. Engineers gave it a little more grunt by first bolting on a new set of cylinder heads featuring larger 1.74-inch exhaust valves, and larger ports. A hotter hydraulic camshaft was also utilized. New cast-iron headers were bolted into place and the intake manifold throttle bores were enlarged. Topping that setup was a new Carter AVS four-barrel and a dual-snorkel air cleaner. The result was an engine rated at 375hp with 480-lbs.ft. of torque. Backing this was the A727 TorqueFlite three-speed automatic as standard equipment, or an optional four-speed manual. Willingness to fork over extra cash could have netted an eager buyer the aforementioned optional 426 Hemi, rated at 425hp and 490-lbs.ft. of torque. Interiors were fitted with bucket seats and a 150-MPH speedometer, and the long list of options included everything from power front disc brakes, to the Sure Grip Differential; even 5.50-inch-wide Magnum 500 wheels, to name a few. But what of performance? The GTX was a purpose-built muscle car, after all. Tipping the scales at roughly 3,500 pounds – give or take, depending on body style, options and passengers – the GTX had ample go-power. Car and Driver reported in the November 1966 issue that a GTX hardtop, fitted with a 375HP 440, TorqueFlite automatic and a final drive ratio of 3.23:1, went from 0-60 MPH in 6.0 seconds and traveled the quarter-mile in 14.4 seconds at 98 MPH. Despite the straight-line skills the new B-body demonstrated, and the flash buyers yearned for, just 681 GTX convertibles were built. As to the Shelby, it’s no secret that its creator, Carroll Shelby, cut his teeth in racing; both behind the wheel and in the design studio. His ties with the Blue Oval boys propelled the 289 small-block to road racing glory in the States and then some, which paved the way for Le Mans fame. The marriage, of course, spawned pit vipers in street trim, including the Mustang-based G.T. 350 and 500 models. As the brief union of strong wills unfolded, however, in hindsight it’s easy to see how the 1968 model year was somewhat special. It was announced that the “base” G.T. 500 would be supplanted by the G.T. 500KR, the last two letters an acronym for “King of the Road.” Built in the months of May through July of ’68, the basis for the change was due to the advent of the 428 Cobra Jet (or CJ) engine. Using the same block and camshaft as the “base” 428, the Cobra Jet featured a cast-iron CJ intake manifold, CJ cylinder heads (C8OE 6090-N) with larger 2.09/1.66-inch valves and matching CJ exhaust manifolds, a 735-cfm Holley four-barrel and a fully functional Ram Air induction system. The 10.6:1 compression Cobra Jet also mandated reinforced shock towers. Surprisingly, it was rated for just 335 hp; however, it’s widely accepted that the engine’s real output in stock trim was somewhere in the realm of 400 horses. Much of the Shelby G.T. 500’s DNA remained unchaged otherwise, including standard equipment such as the Toploader four-speed manual and a 108-inch-wheelbase unit-body chassis was essentially identical as that of a same-year Mustang GT. The only noteworthy Shelby upgrades to the suspension was the swap to a larger .94-inch diameter front anti-roll bar and staggered rear shocks. Visually, the KR only different in rocker panel decal nomenclature, which meant the remaining Shelby body alterations remained. This included fiberglass hoods with twin forward scoops; rear air extractors were installed; a new fiberglass nose pieces; a fiberglass decklid with an integrated spoiler; a rear tail panel that now housed sequential lamps; upper and lower side scoops; and a blacked-out grille that sported rectangular outboard driving lamps. Few had the opportunity to test the mid-year KR, including Hot Rod. Their November 1968 report on the subject – a convertible fitted with the C6 automatic, air conditioning and a final drive ratio of 3.25:1 – produced a quarter-mile time of 14.58 seconds at 98 MPH. Collectively, 1968 witnessed the highest Shelby Mustang output, which included 518 G.T. 500KR convertibles (one of which was sent to Hertz Rent-A-Car; a subtle footnote to the Shelby story that few casual enthusiasts would be shocked to learn). With all this in mind, which of the two would you add to your stable and why?